Antoine Predock kept craning his head skyward. "Look up," he implored. "Look up." Predock was perched on the white translucent alabaster ramps that criss-cross up the Hall of Hope, his signature artistic brush strokes of the Canadian Museum for Human Rights. When lit, the ramps illuminate — a metaphor for the museum itself — and lead visitors up the spiral staircase to the observation deck overlooking the skyline in the historic heart of Winnipeg. It's a journey to the Tower of Hope that begins in an entranceway slightly beneath ground level; from earth to sky. Or, in the description of Predock, "a cloud wrapping a mountain." But Predock, the 78-year-old designer of the CMHR, was a bit of a Rebel Without Applause during a guided tour of his latest creation in early May. He was his usual glib, sly self, decked out in motorcycle racing pants, and seemed braced for those who might throw critical stones at his glass house. "It's so important for architects to shoot their mouths off all the time," Predock said. "It's an epidemic. You can't not do it. But the bottom line is: 'Come to the building.' You don't have to know about cloud or human rights metaphors. Just, 'What do you think?' Here it is. "Experience it with your mind, with your body, with your senses. Take it on. See what happens to you," the architect added. "You don't have to know what the building is trying to do. You shouldn't have to be force-fed that for it to hit you — positively or negatively. It's a love-hate building. We saw that from the beginning. "And this one's begging to be (loved or hated), saying, 'Come on. Come and get me.' "
Better yet, look around. A century after an unparalleled building frenzy that was Winnipeg's Golden Era — and nearly five decades after the Modernist facelift of the 1960s and 1970s — the city is experiencing a renaissance of architectural eye candy. It's coming in all forms and sizes — from world-recognized projects (the Canadian Museum for Human Rights, Manitoba Hydro Place, the Cube stage) to public works edifices (Richardson International Airport, the Millennium Library redevelopment) to sports facilities (the MTS Centre, Investors Group Field) to heritage projects (Red River College's Union Bank Building, Union Station). For Pete's sake, even Hudson the polar bear has world-class, state-of-the-art digs now at Assiniboine Park Zoo. Price tag: $90 million. "Something is happening in Winnipeg," said Johanna Hurme, co-founder of 5468796 Architecture. "The iron is hot. Everyone agrees now is the time to do something. Winnipeg is on the verge of something really incredible." Hurme was born and raised in Finland. The firm's co-founder, Sasa Radulovic, was born in the former war-torn Yugoslavia. They met at the University of Manitoba School of Architecture and opened their firm in 2007 — the first startup architectural firm in Winnipeg in some 15 years. A third partner, Colin Neufeld, joined later. About a dozen startups have followed. The days when Vancouver was described as "Winnipeg West" and London was "Winnipeg East," in terms of siphoning local architectural talent, are over. In fact, of the dozen 30-something employees seated around one large table at the 5468796 office on McDermot Avenue, all but one are U of M grads. All but one are from Manitoba. Together, they have helped put a new wave of Winnipeg architectural style on the map, most notably with the calling card design of the Cube, an open-air stage in the Exchange District (also known as OMS Stage). The design won the 2014 Governor General's Medal for architecture. Jurors described the Cube as a "little gem that restores the architects' role within rituals of daily life in Winnipeg." The accolades have swiftly followed. In a June feature headlined, Reimagining Winnipeg, Globe and Mail architectural writer Alex Bozikovic wrote: "But 5468796 is leading a new generation of local architects to invent a new city, and perhaps a new Canada, that gives innovative architecture a seat at the table. Manitoba's capital city, after decades of stasis, is seeing an architectural rebirth, and 5468796 is at the centre of it." This is the architectural equivalent of gushing usually reserved for, say, Montreal indie rock titans Arcade Fire. And it came on the heels of 5468796's latest innovative adventure: the Table for 1200, where 1,200 diners, clad in white, sat at tables lining the Esplanade Riel to sample the fare of the city's top chefs. Not coincidentally, the pedestrian bridge itself — designed by one of the city's patriarchs of modern architecture, Étienne Gaboury, and opened in 2003 — is widely considered the watershed piece of the current renaissance. The Table for 1200 was a culmination of a project where members of the 5468796 firm won the Prix de Rome for a concept called Table for 12: A Conversation in Architecture. The payoff was a globe-trotting research experiment where the firm would gather architects, artists, journalists, politicians and others for separate dinners in seven cities: New York, Lisbon, Eindhoven (the Netherlands), Copenhagen, Tokyo, Sydney and Mexico City. Said Hurme: "We wanted to learn those lessons, bring them back, and try to implement some of these things." But for Table for 1200, the architects brought their hosts back, too, from around the world. For Hurme, the ambitious exercise falls in line with other inventive, made-in-Winnipeg projects, such as the annual warming-huts competition for the ice-skating trail at The Forks and, more recently, the Raw:Almond pop-up river restaurant during winter's coldest, darkest month. Both endeavours have generated an international buzz. Hurme believes the stagnation that enveloped Winnipeg in the 1980s and 1990s forged the innovation and optimism of today. "We've always had a strong culture scene, music and visual arts," she added. "But architecture is something that has that now. Once you have some successes, you can compare yourself to the best in the world and think we can actually do it." Ager Little Architects is one of those startups, founded by Mark Ager and Gail Little, two U of M graduates who occupy an office, along with six employees, on Broadway. "There's a definite optimism in a lot of places that didn't exist before," Little said. "Developers and the level of risk they'll take now. There's been an energy and spirit that's been renewed. "It feels to me like we're just at the cusp of something that could just take off. We're at the beginning of the curve." David Penner had the audacity to open his firm, Penner Architecture, in the 1990s, when the city's psyche — massive government cutbacks/layoffs, stagnant real estate prices, the loss of the NHL Jets — had skimmed rock bottom. "It drove us, being able to do things with minimal means," Penner said. "It taught us how to get design work through that was very unconventional and creative and compete with the construction costs of conventional buildings. Because there was no money, we learned how to do architecture for less. We still take advantage of that. It's a weapon." Besides, Penner added, "The current generation of young architects didn't go through that depressing '90s thing. They don't have that baggage." Penner is a creative force behind Storefront Manitoba, a non-profit collective with a mission of creating an awareness and appreciation of architecture. That would include, apart from collaborating with Table for 1200, initiatives such as the Winnipeg Design Festival and recent Art + Design Film Festival, held in conjunction with Winnipeg's hosting of the Royal Architectural Institute of Canada's Festival of Architecture in May. Penner mildly balks at the century-old notion of City Beautiful; that grand buildings make noble citizens. But at the same time, Penner believes architecture embodies the DNA of a city, and its citizens. "What do they say forms your personality? Environment and heredity," he reasoned. "Architecture is a big part of the environmental side. Good environments make us feel good. I'm committed to that idea. So are most architects and designers. "I don't know if it's a matter of it should be important to you," Penner added. "It is important even if you don't realize it... My feeling is if the public understands why that has value it will have influence over development." Hurme said there is a societal shift in Winnipeg toward the visual. The unique. The smart. Think of the warming hut competition, which now attracts entries from firms around the world — to build a modest hut on a frozen river in Manitoba. "A population has always understood a big building to be architecture, right? You can look at it, you can find out who designed it, you can have an opinion about it. You either hate or you love it. But just recently people have started to notice everything you build affects your environment... I think our biggest enemy when we started was ambivalence; an ambivalence about architecture in general and what design can bring in terms of value to the community as a whole. That's turned around. That's why we see the optimism that is surfacing." In fact, it could be argued that if there is a renaissance in Winnipeg's architectural community, it's as much about the architects as the buildings themselves. The days of siphoning off local architectural talent is over. Brandon Bergem and Shannon Wiebe at 5468796 Architecture. "There's more of a sense of optimism and opportunity at the moment," noted Jon Trenholm, an associate and project architect for LM Architectural Group. "It used to be pretty straightforward where there was a few larger firms, a couple medium sized firms and your one- or two-people shops. And each category went after its specific type of work. Now it's completely open. Clients are more open to approaching different offices. It's a healthy competition." Further, some of those same architects and firms regularly attend "critique sessions," presenting projects to their peers in a discussion of design. Call it architectural jamming. "The idea is a gathering and drawing together from a collective expertise; the idea is that the overall quality of the work will be elevated," said Trenholm, who, along with Gail Little, co-chaired the Royal Architectural Institute of Canada's annual festival in Winnipeg last summer. For comparison, think of Winnipeg's vibrant music scene in the early 1960s, an era defined by raw, creative energy spawned from a community that included the likes of Burton Cummings, Randy Bachman and Neil Young. "We use the term renaissance as a way of saying there's a rebirth. But it's more about a general energy in the city culturally," Trenholm added. "There's a refocus on what Winnipeg is and how we're defined. It's tough to give it a single title. "You see it translated though some of these younger entrepreneurs that are setting up specific restaurants and coffee shops. One thing that's been successful is this merging of design and art and culture in the younger generation within the city." The hypermodernist performance stage is the winner of the 2014 Governor General's Medal for architecture. It is "a small urban gesture but a large contribution to the city. This building works on many levels: as sculpture, performing stage, folly and meeting place," GG jurists said. "Its innovative and flexible design allows for constant transformation to accommodate a variety of programs and activities, year-round. It expands the realm of possibilities associated with a bandstand and is a shining reminder of the architect's responsibility to animate the public realm." Has been called one of 'the World's Most Stylish Airports.' Its most striking feature is the 55 dome-shaped skylights. It has been lauded for its industry-leading approach to sustainable design. Two 18-storey twin office towers, which rest on a stepped, three-storey, street-scaled podium, converge at the north and splay open to the south for maximum exposure sunlight and southerly winds. The podium includes a publicly accessible Galleria to offer citizens a sheltered pedestrian route through a full city block. A 115-metre (377-foot) solar chimney marks the north elevation and main entrance on Portage Avenue,. It has won numerous awards, including the LEED Platinum certification in 2012, making it the most energy-efficient office tower in North America and the only office tower in Canada to receive this prestigious rating. From the alabaster quarried from Spain to the black basalt from Mongolia, and from the glass 'Cloud' and spiral staircase to the Tower of Hope, the building, with its unique geometry and textures, is equally as important as the content. It is designed to represent human rights ideals and to provoke visitors. The structure, cable-stayed from a single, transversely inclined pylon rising 57 metres above the Red River, reflects the lightweight nature of its pedestrian traffic, while the spire signifies a place of meeting in the middle of the river. The restoration and addition to Winnipeg's first skyscraper is the latest addition to Red River College's downtown campus and home to the culinary arts and hospitality programs. It is believed to be Canada's oldest surviving steel and concrete reinforced structure and is a National Historic Site. The project included restoring the majestic 28-foot plaster ceilings in the bank's main hall. A multi-award winner, including the Governor General's Medal in architecture. The expanded and renovated library included adding a fourth storey, a multi-level reading terrace and a four-storey glass curtain wall overlooking an urban park to the south. It's one of the most unique stadium roofs anywhere — the now iconic two partial canopies of rolling metal and steel cover 3.2 hectares of seating, which protects 80 per cent of spectators from the elements and offers an enhanced sense of intimacy. Built on the site of Winnipeg's landmark Eaton's building, the home for the NHL Jets incorporates a red brick design in honour of the site's predecessor. Without the MTS Centre, there would be no NHL Jets. Of course, optimism is in the eye of the beholder. Wins Bridgman is standing at his office window at the corner of Main Street and Higgins Avenue, pointing to the vacant lot that once housed the Royal Alexandra Hotel (1906), a grand dame in the days when Winnipeg was drunk with possibilities. Or cheap beer. The Alexandra was the sister to the adjacent Canadian Pacific Railway Station, built at a cost of $1 million, and its 450 rooms and luxury suites were a beacon for the weary and wealthy traveller. When the doors of the hotel first swung open, the Winnipeg Tribune said the Alexandra was "a guarantee in brick and stone that the future growth of Winnipeg is assured." The Alexandra was abandoned in 1967 and demolished in 1971. Bridgman's vantage point is just to the south, in the old Dominion Bank building (1907) that his firm, BridgmanCollaborative Architecture, bought and renovated eight years ago. Looking towards the ghost of the Alexandra, Bridgman said: "Main Street was filled with taverns and activities and vaudeville. All of the magnificence of a big city. This was the centre of our culture. We really see the place where people came, where people were introduced to a new life." "Buildings leave traces of an earlier order," Bridgman said. "And when those buildings are erased or altered almost beyond recognition, there is a sense of civic amnesia. It's as though Higgins and Main has become an area that was derelict and had no civic meaning." The result: The CPR underpass — just as it was at the turn of the century — remains an economic and cultural Rubicon. "It's as though it's the dark recess of history and prejudice that we see going through it," Bridgman said. "Because when you go under the underpass, if you're a pedestrian, you are forced to feel you're going into a place of 'other.' You're forced to feel that you, by walking from one part of the city to another, are in danger. After all, there's no one else to see you. It's dark. It smells of urine. It feels as if you're not in the Winnipeg you know, but in a dangerous place." Bridgman, a heritage specialist for 30 years, has staked his firm on changing the perception. Since arriving from Toronto at the turn of the last century, he fell for the Exchange District, "up there with the Wonders of the World". Why? The raw beauty of weathered buildings "They're big and robust," Bridgman said, of the warehouses and Banker's Row, "and they have a belief in an economy and optimism that was there at that time, the turn of the century." The buildings remain. But what about the belief? This question begs to be asked: Would the predecessors who envisioned a metropolis of 4.5 million-plus by 1984 be disappointed in us? Should we be disappointed in ourselves? Bridgman's reply is part philosophical, part parental. "Every child... you have great dreams for," he said. "And your child may or may not be the prime minister of Canada. It could happen that your child developed in different ways than you first imagined. It doesn't mean that you don't love that child. And it doesn't mean you still don't dream for what the future of that child might be. Or that child's child. "It means that you understand the events that occurred that created the condition for that person's life," he added. "And you continue to be hopeful and do everything you can do to support that child's life." The buildings from Winnipeg's golden era include Union Station, which was modelled after New York City's Grand Central Terminal. Bridgman's firm recently completed a $6.5-million facelift of the station. You can blame the Panama Canal, the most cited culprit in undercutting Winnipeg's rise to a great metropolis. But as Winnipeg author and architectural historian Frank Albo noted: "There's more. There's always more." According to many historians, the violent General Strike of 1919 cooled venture capitalists on the city. There was a Great War, followed by a Great Depression. Advances in transportation and technology caused Winnipeg to go from one of the most pivotal geographic warehouses of North America in the 20th century to a modest prairie burgh often described as "isolated" in the 21st. Also, the real estate bubble created by a handful of savvy, forward-thinking visionaries in the early 1900s — luring both foreign homesteader and foreign investment — could not sustain itself any more than, as was advertised, men wearing shirt sleeves at New Year's. Albo will even suggest the civic struggle pitting City Beautiful against its robust vices could be declared a victory for the latter. "Maybe what we couldn't overcome were the transcendent, primordial forces that were also brewing here with equal vigor," Albo said. "They weren't directly at odds but maybe ideologically at odds of that highbrow vision." Historian Alan Artibise also concluded the same population explosion at the turn of the last century — combined with the thirst for growth and wealth by city elites — ultimately worked against Winnipeg. News of typhoid and slum conditions only encouraged immigrants to continue heading further west, where population growth in Saskatchewan and Alberta soon began to exceed Manitoba's. "Programs designed to encourage population growth and thus cause even more acute problems are something of a paradox," Artibise wrote in Gateway City. "It is rather like trying to repair, maintain, and fuel a car while pressing the accelerator to the floor. Viewed from this perspective, the campaign for immigrants and industry stands as a monument to the failure of Winnipeg's leaders to develop a mature social conscience. The folly of the elite's overriding concern with population and economic growth made itself apparent in the social strife Winnipeg was to endure in 1919 and after." But that's ancient history. What of today? Is this latest architectural "renaissance" a stirring of Winnipeg's unachieved potential? Is it even a renaissance at all? For Brent Bellamy, creative director and architect at Number TEN Architectural Group, the answer is an unequivocal "Yes." And it's not just about bricks and mortar, Bellamy said, citing the return of the NHL as a catalyst for construction. Why? Because architecture only happens when there's building, building only happens when there's money, and money only appears when there's optimism about the future. "Proponents can point to numbers that say it's a great boon to the city and opponents can point to numbers that say it doesn't do anything," Bellamy said. "But I believe there's a greater layer to it that does actually happen. We're seeing it now. We're getting a lot of clients with the return of the Jets and being a part of a bigger club (the NHL) like that — we're getting developers from Toronto, Vancouver, Calgary that are coming to Winnipeg who feel there's a different attitude here. "Winnipeg for so long — since the '60s — had this image that we only bought wholesale and everything was cheap. We wouldn't pay for anything good. But clearly if you give the right product, people will pay for it." "It's about how people, instead of getting their morning coffee from McDonald's or Tim Hortons, they're going to the specialized little coffee shop and they're willing to pay twice as much because they're investing in, 'This is the best coffee I can get.' Life is short, might as well enjoy it. That sort of attitude is coming back," she said. It's true that Winnipeg's DNA, according to reputation, is associated with — to put it politely — value. It's the Wholesale City. But Serena Keshavjee says the great expectations, now a century old, remain in the city's bloodstream. Asked if our predecessors of 1914 would look with disdain on the Winnipeg of 2014, Keshavjee, University of Winnipeg associate professor of art history, replied: "I feel like that very wealthy, ambitious, strong past is still here. We might have been this other city. There's this parallel life we could have had that we love to dream about. I think that motivates us to some degree. We always want to be that incredible city again. It's probably never going to happen, but it makes us an ambitious people. That history shaped us to who we are to this very day." A city that gives birth to the Royal Winnipeg Ballet, the Winnipeg Art Gallery and filmmaker Guy Maddin must possess cultural depth, Keshavjee said. "I don't think this is normal for small cities. I think it's something very special." Today, however, heralds the opening of the Canadian Museum for Human Rights, arguably the most iconic architectural event since the unveiling of the Manitoba Legislative Building in 1920. As Predock understands — or even anticipates — the reviews of the museum's esthetics will be heavily debated. It's Winnipeg, remember. In fact, more than a few architects interviewed for this project politely demurred when asked about Predock's work. But overall the reactions were positive — even if mildly so, although set against a backdrop of world-class expectations. Hurme, for example, does not believe the CMHR will create a Bilbao Effect, referring to the impact of Frank Gehry's Guggenheim Museum on Bilbao, Spain, which became an architectural mecca after the building was unveiled in 1997. "I don't think it's as good of an example of its time," Hurme said. "It falls a bit short on that, honestly. Yes, we'll get a lot of attention. It's a moment we can capture." Without question, Hurme said the totality of the building and its contents will undoubtedly move visitors. "If it does that to people, absolutely, it's worth every penny." Even historian and architectural author Randy Rostecki offered what might be the ultimate compliment from a heritage watchdog. "I won't say it's beautiful, but it's unique. 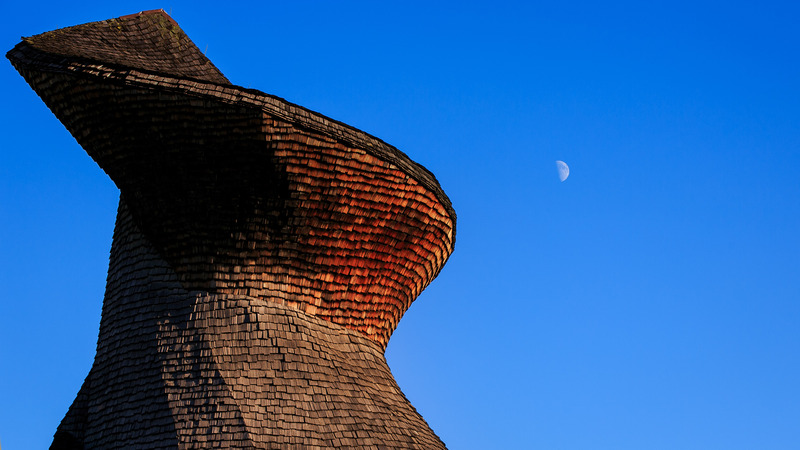 Maybe it's like old (Gingerbread) city hall," Rostecki said. "You won't see anything like it in the world. It will take time to grow on people. Maybe 20 years down the pike you can have a more objective view." Bellamy, meanwhile, said Predock's creation will, not unlike the return of the NHL, embody a larger reflection of Winnipeg to the outside world. "I think it represents this new era in a weird way," he said. "It's way over budget, obviously. But it's by far the most private donations ever for a museum in Canada — by a mile. It really speaks to the optimism of this era to me. It's not just about that building. It's about the bigger convention centre, it's about the MTS Centre, the new airport. It's about the new library. It's all about this renaissance that's happening. Even the downtown residential that's happening all through the Exchange District. "I think in five years we're going to look back, like the MTS Centre, and go, 'Wow, I can't believe that (the construction of the CMHR) happened," he added. "If you had proposed that in 1990, not a chance it would have been built. It was because Winnipeg had changed. It was perfect timing. Winnipeg was looking forward for the first time in a long time." Union Station in 1913, a year after it opened, and today (Archives of Manitoba, John Woods / Winnipeg Free Press). Critical question: Is Winnipeg still moving forward? Glen Murray was Winnipeg's mayor from 1998 to 2004 — when the seeds were sown for much of its recent architectural growth. Now Ontario's provincial minister of environment and climate change, Murray still champions the city's skyline. "I would say that the architecture in Winnipeg — like the human rights building, like Red River College (downtown), like the Hydro building, like the Esplanade Riel — those buildings are of a higher quality than most of the architecture being built in Toronto," said Murray, from Toronto. "We don't have bank head offices. We don't have huge development booms. We're not building a condo tower on every corner in Winnipeg. But the quality of architecture in Winnipeg, I would say, is the best of any major Canadian city. And Winnipeggers should be very proud of that. They do a great deal with very little." "I think there has been a renaissance that was going on when all these building projects were initiated. Those projects were initiated 10 years ago and they're just getting built now. All of those decisions were made in the late 1990s to 2004-2005," Murray added. "You really haven't seen in six or seven years now any new major private/public partnerships. And a lot of the policies and tax credits that were in place are now gone. "So if there isn't any invigoration soon of those types of policies and initiatives... I think you'll see another period of time where it (construction) goes flat, or what we saw in the '80s when there was very little building or development." Murray's opinion could be seen as self-serving. But he's far from alone. After all, since the old city hall first rose above William Avenue in 1876, the impetus behind Winnipeg's three distinct eras of architectural/urban growth have had three common denominators: relative prosperity (including high wheat prices/rising real estate values), public funding and solid civic backing. Winnipeg's Main Street in 1907 and today (Archives of Manitoba, Melissa Tait / Winnipeg Free Press). "It's a slow process, but it happens," Hurme said. "We need a progressive mayor, someone who understands what it means to be a well-designed city; how it raises morale, how it creates better spaces, how it boosts tourism." Hurme could have been talking about a civic election in 1905 or 1965. Except in those eras, just as in the mid-1990s, there was a conceptual vision of what might become, if not what it was at the time. "There is no real planning at the city level," said Gaboury, whose architecture has helped define Winnipeg's landscape. "It's a very haphazard approach. I think that's unfortunate. But you can't say there's any vision. No sense of direction. There's certainly no planning. "There's also the question of ideology. I don't think there is a sense of the city of Winnipeg, who we are, what we want to be or where we want to go." The suburbs in the south are expanding manically. Core regeneration proceeds in spurts. No master plan is articulated. For Gaboury, the mere fact that a giant water park was considered for the empty lot adjacent to the CMHR screams of esthetic and cultural indifference. "Talk about a lack of vision," he said. "To me, this is systematic about what's happening in Winnipeg. And we have to have leadership that's more than just preoccupation with the really mundane, like potholes and stuff." But how can a city have notions of grandeur when infrastructure is falling apart? "Those are two different things," Gaboury replied. "Infrastructure is a matter of finances, right? It's not a matter of boldness or vision. It's just practical. The point is if you do something, you have to stick your neck out and do it. You have to fight for it. You have to have some sense of where you want to go and what you want to achieve. Is it possible we can generate pride in the city, pride via awareness of all the beautiful things we have? To me, that would be a subtle but powerful means of assuring this regeneration. People wouldn't accept mediocrity and want higher and higher standards." Where can Winnipeg's future be found? Curiously enough, the majority of planners and city architects — not just now, but 50 years ago — have a similar answer: in the past. Or more accurately, where the past began. In the beginning, there was the meeting of the Red and Assiniboine rivers. But for decades, that historic intersection was treated as an afterthought. Maybe because the rivers were a source of typhoid, or mosquitoes, or floods. Over the last 20 years, of course, The Forks area has been transformed: the Esplanade, the ballpark, the market, Waterfront Drive and now the CMHR. More development is on the drawing board, in particular residential condos. "We are building to our river," Bridgman said. "We are making the river the centre of our city. It's as though our roads are confusing arguments that push one way and another, leading us astray from what the centre is. And if we are to remember Winnipeg and fall in love again with Winnipeg, we need to start back at the rivers." How quaint, yet how profound; to think that the same meeting of "muddy waters" that gave birth to the city would centuries later be the scene of its renaissance. The muddy Red River, long viewed as a hinderance, now symbolizes a rebirth. At least, if the renaissance isn't already over. Perhaps the tower construction cranes, as Murray warned, will disappear once again. Maybe short bursts of regeneration are all that a modest Canadian Prairie city can expect. "We'll see," Bellamy said. "But it's a unique time, for sure. For the first time in a long time, the design and quality of our city mean something to people. They want our city to be like other cities. They look at Toronto and say, 'Why can't we have a great shopping street? Why can't we have a grand public meeting space?' We're finally starting to look beyond the Perimeter Highway." Then there's Predock, who, not surprisingly, argues that it's not just refreshing for cities to evolve architecturally. It's essential. "Cities don't have finite boundaries historically in terms of architecture," he said. "It's always growing and evolving. Cities are processes that are unending. I think it's great when a city sheds its skin like a snake and just moves along with wherever times are going. It can come out of nowhere, like this, maybe. Cities that are alive keep moving." If you want to make an architect smile, show him a building crane, the taller the better. And what city dweller doesn't take a second look when he sees a construction site with a sign reading, "Coming Soon..."? "There's something that really is symbolic," noted Little, "about seeing a crane on your skyline." History records the skyline speaks volumes about the community that builds them, too; be they heavy, be they cultured, be they symbolic of power. Be they environmentally friendly or just the function. 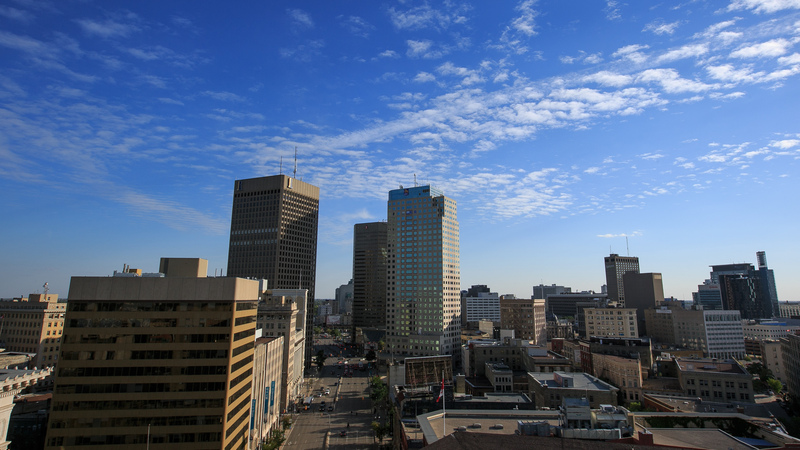 The Winnipeg skyline speaks to the city's past, present and future. Architecture is an archeological dig in reverse. It's a structural timeline of a city that, decades into the future, tells a story about the past. There was a time, a century ago, when this city held visions of becoming something else; something larger, more important: a city that rose from the prairie mud to matter. Some 50 years ago, after decades of stagnation, Winnipeggers strove to recapture some of that long ago grandeur. Their vision was to shed that aging architectural skin. They longed to be modern, and matter again. It only stands to reason: If cities were people — and aren't they all? — wouldn't they all want to matter? Wouldn't they all strive to leave their mark on history? In the end, if the archeological architecture of Winnipeg has shown anything, it's that its citizens have always tried. The story, after all, is written in Tyndall stone. "Buildings are their best as an expression of culture," Hurme said. "They're an expression of us as people, as a community, as a collective. They're a reflection of our time. The things that are timeless, in my mind, are buildings that pushed the envelope. That's why we believe strongly that as opposed to imitating the past or looking at how the next guy did it, we're trying to find new ways to express it." So where has Winnipeg been? Where is it going? The answer, as always, can be found in the skyline. In the words of Antoine Predock, look up. Contributors: Frank Albo, Mike Aporius, Eric Bailey, Brent Bellamy, Andrew Burton, Wendy Sawatzky, Nicholas Schraml, Tyler Walsh, and Karen Wiecek. Special thanks to the staff at the Archives of Manitoba, City of Winnipeg Archives, the University of Manitoba Archives & Special Collections, City of Winnipeg Planning, Property and Development, Société historique de Saint-Boniface Archives and Winnipeg Architecture Foundation.